This is my “special morning” breakfast. Thanksgiving morning? Making french toast. Christmas morning? Making french toast. And I don’t mean to get you all too excited, but this girl has a birthday coming up on Monday and you better believe I will be eating this french toast for breakfast. Along with a mimosa, or two or three. Because, heck, it’s my birthday and a holiday weekend, so cheers to me! And like a true San Francisco girl, I love sourdough french toast. Regular french toast is too much sweet on sweet on sweet for me. The sourness of the sourdough bread cuts through the sweetness of the syrup, and I don’t feel like I ate a pound of sugar for breakfast. Which even though I did probably eat a pound of sugar, the sour tricks my stomach into telling my brain it was basically a healthy breakfast. Let’s not tell my brain. My birthday is the 17th, and it almost always falls on President’s Day Weekend, which means my birthday is usually a 3 day weekend. How lucky am I? When I was little I assumed everybody got the day off from school for their birthday. Nope, just me. My 16th birthday was one of the rare years where my birthday was after the 3 day weekend, which meant I got to take my license test on my actual birthday. The universe is so good to me. I don’t think I could have waited another day to become a licensed driver. 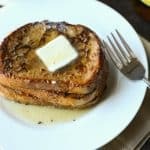 This sourdough french toast recipe was one of the first recipes I was able to make without the directions or ingredients written down. When I make the batter I splash in some milk, and add in enough eggs until the consistency looks “right”. Then I splash in some vanilla and watch the batter do a little dance as the vanilla cuts through the eggs and milk. Finish it off with a few sprinkles of cinnamon and it’s done. Since directions like that wouldn’t be very helpful to you, I actually measured everything out. Which should also be helpful to my husband because when he makes it for me he has a hard time following the recipe that only exists in my brain. 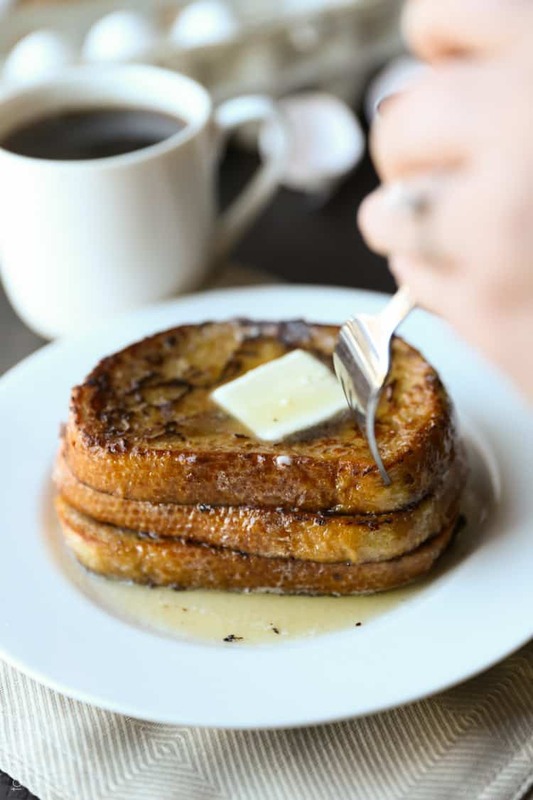 So treat yourself and make this sourdough french toast on Monday morning, enjoy your day off, and take a big nap afterwards. That’s what I’ll be doing. 2. 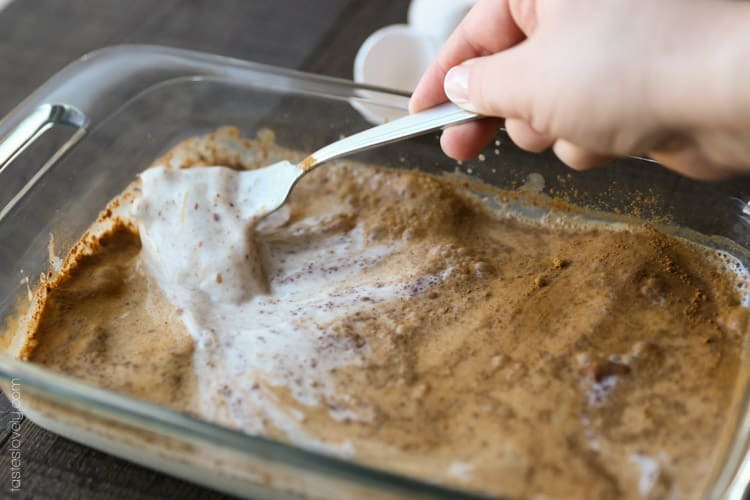 In a 9×13 baking dish, make the batter by combining the milk, eggs, vanilla and cinnamon. Beat to combine. 3. Heat a large nonstick pan over medium high heat. Melt 1 tablespoon of butter in the pan. Dredge the sourdough bread in the batter, turning it 3 times and lightly pressing on the bread so it absorbs the batter. Cook 3 slices of the battered bread in the pan at a time. Flip the bread after the first side is crispy, about 3-4 minutes. Melt another tablespoon of butter in the pan before flipping so the second side also cooks in butter. This will make both sides of the bread crispy. Cook the second side until it is also crispy, another 2-3 minutes. 4. 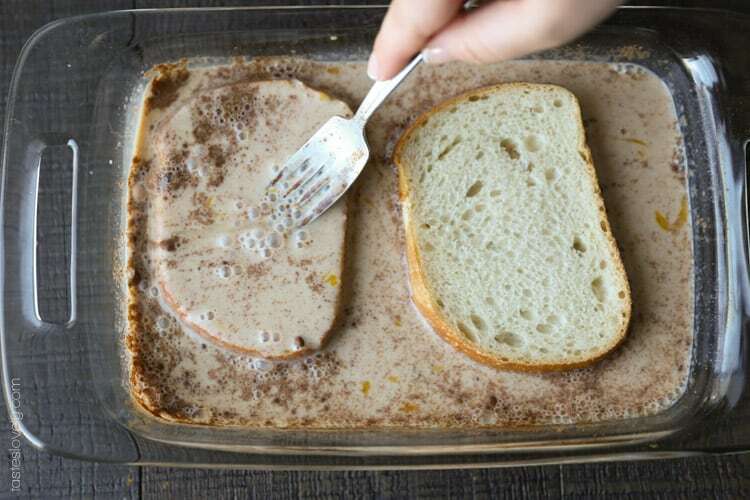 Keep the cooked french toast warm by leaving it in the oven in an oven safe baking dish. 5. Repeat step 3 for the remaining bread. 6. 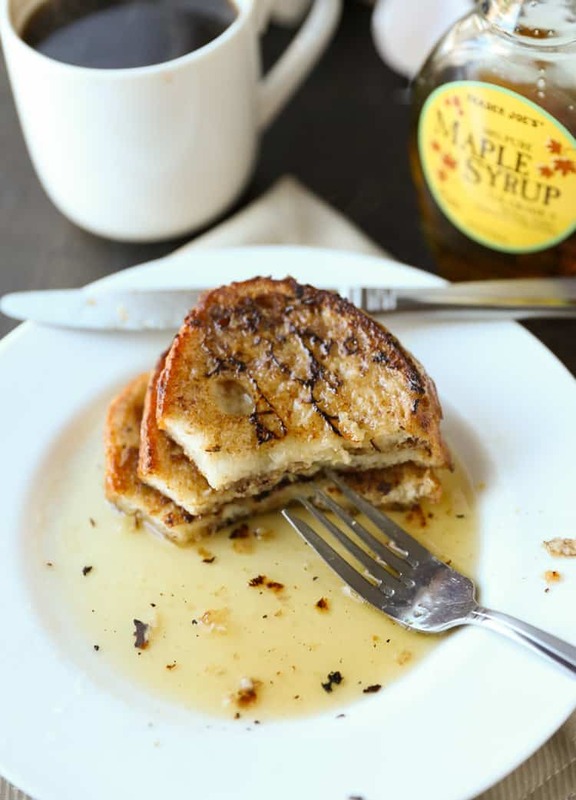 Serve warm with maple syrup and more butter (optional). Will keep an airtight container container for 1 week. You can reheat it on the stove in a pan, in the oven, or even in the toaster. 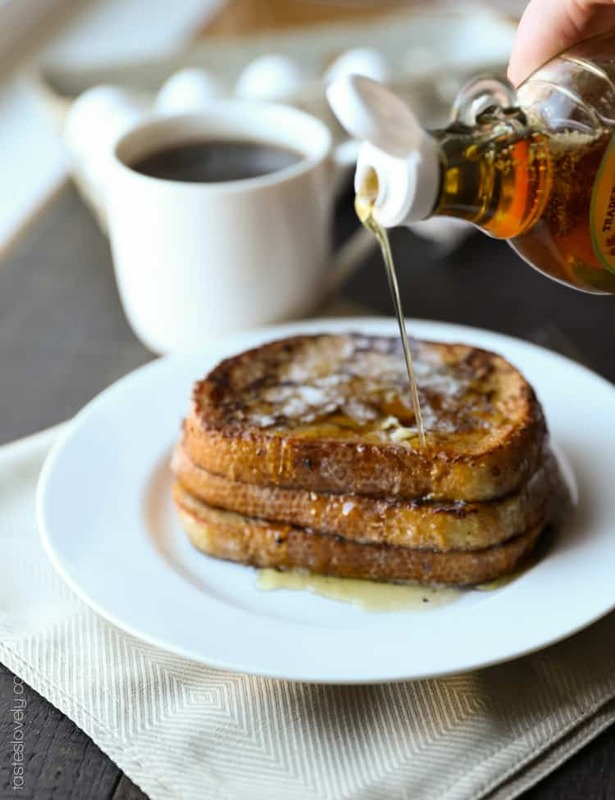 Heck yes for crispy French toast! I am loving your version with sourdough. 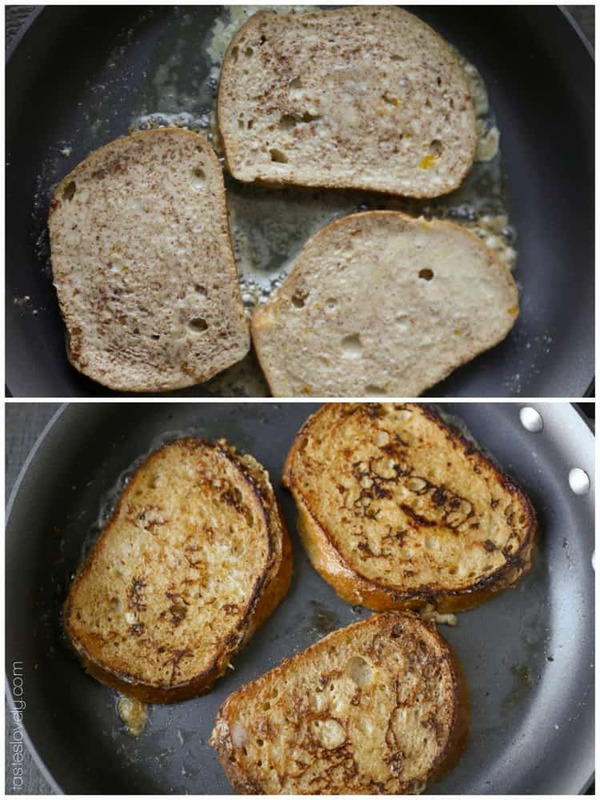 It’s a bread I adore, but I hadn’t ever thought to use it for French toast. I bet it totally cuts down on the sweetness. I didn’t even think about the likelihood of your birthday falling on a holiday weekend. Why did I have to be born early? :) I am laughing about your 16th birthday because I’m thinking of my 16-year-old self and know waiting one more day to get my license would have killed me. I hope you have a great weekend planned. Extended birthday celebrations are the best! I am all about crispy french toast. I like to hear it “crunch” when I bite in to it. Soggy french toast is unacceptable! You must try it with sourdough bread sometime. It balances the flavors so well. Aren’t I so lucky to have a 3 day weekend for most birthdays? It’s the best. At least you have a 3 day weekend right after your birthday. And you weren’t born on Valentine’s day. I always think that would have been so weird. Hey! My bday is January 17, so I often get a 3 day weekend because of MLK day! Don’t you love the 3 day weekend? It’s like a bonus day of celebrating! 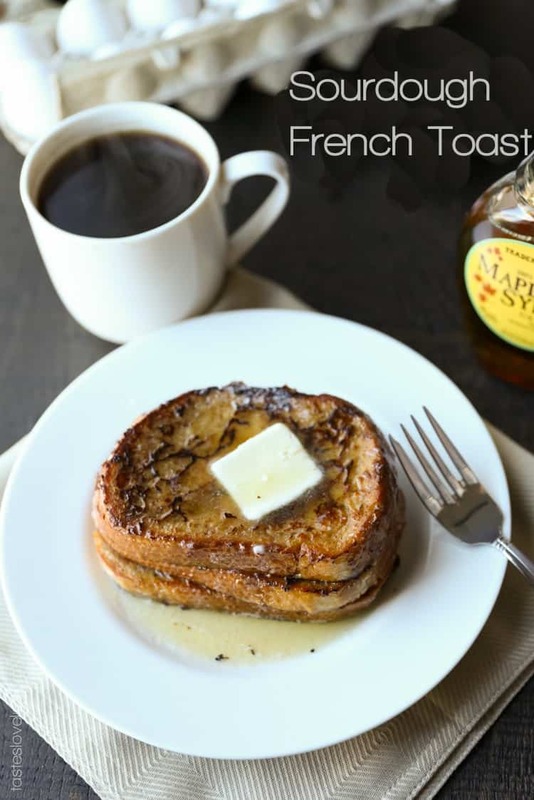 This french toast looks so good, and I love the Trader Joe’s maple syrup, it’s our favorite! Another 17th birthday! And you would fall right around MLK day. That’s awesome! Lucky us. It’s like the whole nation takes the day off to observe our bdays. Ha! Trader Joe’s maple syrup is my favorite too. It’s so affordable! I’m actually an aquarius. Right on the date cut off! Isn’t french toast the best? I couldn’t photograph this fast enough so I could start eating it. haha! Our birthdays are so close together! sourdough french toast is my love language. please make this when i move out there and come see you guys! also meant to add that you have just rocked my world by dipping the french toast in a 13×9 pan instead of a bowl. genius. Duh I’m going to make this for you when you come out here! But it will have to be on a very lazy day when I can wear stretchy pants and take a nap. Sound good? Haha! And I never thought about how genius it was to use a 9×13 pan. That’s my mom’s genius right there, I learn from the best. But it is definitely easier than using a bowl for big slices of bread. Do it next time. Do it! Yummmmm!!! What time should I be over for breakfast tomorrow? oh man I am dying for breakfast for dinner right now!!! 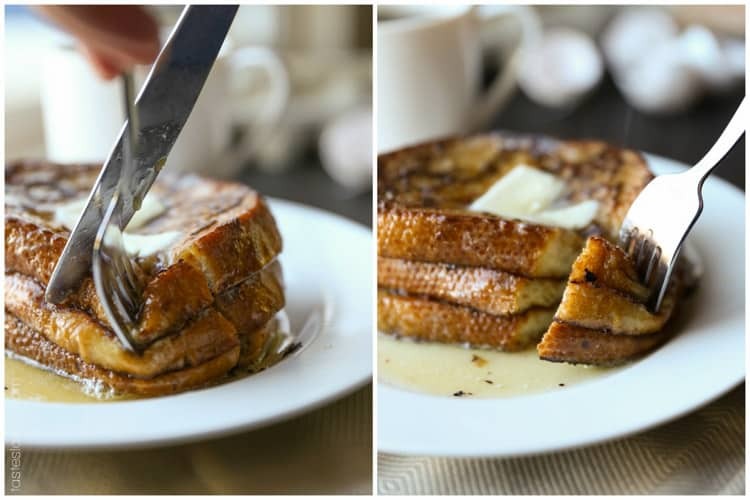 this french toast looks so warm and inviting, definitely a romantic dish for V-Day! French Toast is the best! Such a decadent breakfast yet so easy. Happy early birthday! SWOONING over this right now! I can just about taste the tang of the sourdough with the sweetness from the syrup. What a great balance. The weekend can’t come soon enough! I’ve been on a french toast kick lately (meaning: I’ve been having it for breakfast, afternoon snack and dinner for the past four days. Yeah it’s quite obsessive if you think about it but it’s soooo good) and I think I’m having this tomorrow. You made this one look so so good! Happy Birthday weekend. I hope you enjoy it and get to eat a lot of yummy stuff (aka french toast)!! I can’t wait for breakfast. I seriously wish I could have snagged a plate from you because these pictures are making me drool!! 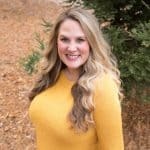 Natalie!!! Happy Almost Birthday!! I’m so glad I’m not the only one who gets up on a lazy weekend, makes an elaborate breakfast….then goes back to bed. That’s the life. :) I’m loving this sourdough idea! Trying this out for Eric, I think he will love it! Oh my gosh, I just woke up AND I want this french toast now!! it looks so delicious! Sigh, sourdough is so San Francisco and I love it! Sourdough is SO San Francisco! I love it too. Now that’s French toast! Looks absolutely delicious. I think I just wasted 3 cups milk and 4 eggs. Did you mean 3cups milk??? Or more like 1/3 cup milk? 3 cups of milk? Are we feeding an army? Anyone else find this an excessive amount of milk? I’ve heard others say this is a lot of milk. But it’s how we’ve always made it in my family! I’ve made this 4 times in the last 2 weeks! Making it for the fifth time tonight! This is by far the best french toast I’ve ever made. Honestly I don’t know that I’ll ever be able to eat french toast at a restaurant again after having this. The sourdough makes amazing french toast and I never in a million years would have thought of it myself. After years of trying out various recipes and different types of bread, this recipe is definitely my winner. Thank you for sharing it! Chrissy! You have made my day! I’m so glad you love it. It’s my favorite french toast. It’s actually ruined all restaurant french toast for me. I like mine thin and crispy, but restaurants are always THICK and “mushy”. And the combo of sour and sweet is the best! You are too nice. Glad you like my recipe. Hope you have the best weekend! Loves it! I sub the butter for coconut oil. Though different taste, still very good. I’m so glad you liked it Benny! And how crazy is this: I made this french toast for breakfast yesterday too WITH COCONUT OIL! Great minds think alike! We’re 100% dairy free now, and I almost like it better with the coconut oil. Thanks for letting me know you liked my recipe, you made my day! what brand of sour dough bread do you use? It looks good.